With greater ambition, the Liberal Democrats’ policy of increasing the personal allowance would equalise the Living Wage and the minimum wage, without risking jobs. It was announced yesterday that the national ‘Living Wage’ for 2013/14 will be £7.45. This compares to the National Minimum Wage of £6.19. Boris Johnson has urged more companies to adopt the Living Wage, and Labour are even considering giving tax incentives for firms to pay the Living Wage. Few would argue with the benefits of higher pay for employees, or with other Living Wage benefits such as lower staff turnover. But evidently most employers are not convinced that this is a good deal, while the Low Pay Commission gives careful thought to how high it can set the minimum wage without an unacceptable impact on unemployment. This leaves us with only 2% of workers paid the minimum wage, but 20% on less than the Living Wage. However, the real consideration for employees is post-tax income, while for employers it is the total cost of paying a given wage. So the Living Wage debate must also look at the difference between what employers pay and employees get: what the government takes from minimum wage workers in income tax and National Insurance. In April, the post-tax income of someone working full-time on the Living Wage will be £12,700, while the pre-tax income of someone on the minimum wage is… £12,700. It is only a £1,700 tax wedge that divides the minimum wage and the Living Wage. 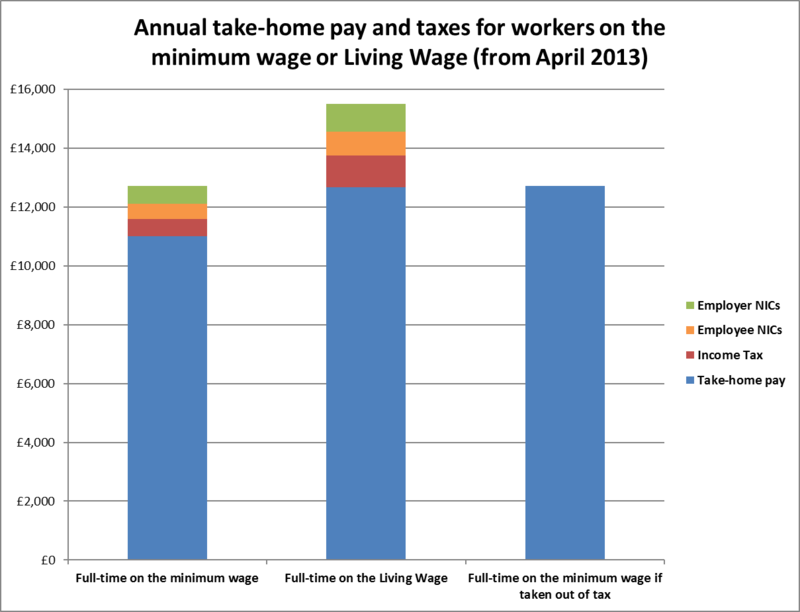 The graph below shows a comparison of the minimum wage and Living Wage, with the all-important take-home pay in blue (full-time here meaning 37.5 hours a week). What this shows is that we could deliver the living standard that comes with the Living Wage by taking minimum wage work out of tax. This is represented by the third bar in the graph. Raising the personal allowance to £10,000 will close some of the gap, but it would need to rise beyond £12,000, as must the National Insurance (NICs) thresholds (this includes employers’ NICs, as “in the long run, wages absorb changes in payroll taxes”). The graph shows that NICs are even more important than income tax. Raising the income tax and NICs thresholds so significantly would be a huge change, and unaffordable at present. It should also be said that part-time minimum wage workers wouldn’t benefit directly, unlike with the Living Wage, but these tax cuts would reduce marginal rates, making extra hours more attractive and encouraging second earners into full-time work. Employers may justifiably say that the only reason their minimum wage is insufficient is that the government is taxing minimum wage work. But this is not to disparage the Living Wage campaign. They are right to say that some employers could pay more. We must also be careful not to replace the last decade’s policy of using tax credits to prop up stagnating incomes with a similar approach using tax cuts. There are also very significant problems with the party’s allowance-raising policy, not least how to fund it. These are despite the attraction of not taxing those whose wages are not even deemed to give a basic standard of living. All these issues will be explored in a future CentreForum report. For now though, it’s neat to note that an ambitious rebalancing of the tax system would at the same time deliver the Living Wage for workers in all sectors. Acknowledgement: The Adam Smith Institute has (somewhat worryingly) come to the same conclusion. Also see Nick Thornsby’s article.